Easily design a professional-looking, formal proposal from your own computer and printer with customized dividers. Print-On® Dividers deliver picture-perfect presentations that are perfect for proposals, PowerPoint presentations and more. Easily design a professional-looking, formal proposal from your own computer and printer with customized dividers. Print-On® Dividers deliver picture-perfect presentations that are perfect for proposals, PowerPoint presentations and more. Create customized project dividers in minutes using the Avery® Design and Print Online software. Easily add text and sharp graphics and print directly onto the tabs and divider body with your own laser or inkjet printer. Print in either landscape or portrait format, making them ideal for presentations and reports. Dividers are made of 20% post-consumer recycled material. Always make the perfect presentation with these customizable dividers. 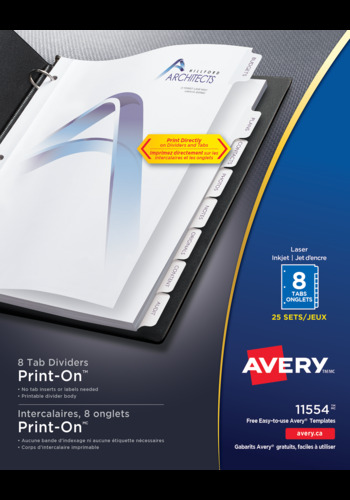 Print directly on tabs and divider body with no labels to apply. Create customized dividers in minutes right from your own computer. Add text and sharp graphics to both the tabs and divider body in just one pass through the printer.